Riff Raff, just say no..
Say no to the paid off MVP mob force that is trying to squash any bit of truth when one of their own screws up. Say no to the events that make you pay to watch infomercials, eat in a parking lot and then spam you. Spend it to send a thank you postcard from your vacation to the SMB blogging elite that calls it like it is and never asks for a damn thing in return: Susan Bradley, Susanne Dansey, Tim Barrett, Eriq Neale, Andy Goodman Blog, Andy Goodman Chat, Dana Epp, Vijay Riyaait, Chad Gross, Dean Calvert, Andy Parkes, David Mackie, David Schrag, Steve Wright, Jeff Altman, Bill Leeman, Anne Stanton, Richard Tubb, Bill Waters, Jason Lieb, Karl Palachuk, Mark Crall, Larry Lentz, Nick Whittome, Kevin Weilbacher, Amy Babinchak and the TS2 community guys who although Microsoft employees probably spend more than anyone outside of 9–5 to locally support the SMB community. Bring some food, drag a vendor, contribute a presentation or share notes from your SMB user group meeting.. or start one. These are the people and events that build our community, if you like them support them. If you want to call yourself a leader try being honest about the past mistakes instead of glossing over them, try supporting and promoting new blood instead of clapping on your old social circle, try focusing on the big picture of promoting community involvement instead of nitpicking little nuances to support taking people to the wallet cleaners and locking them into your limited frame of thinking. You’re either leading, or standing in its way. I hope you choose correctly. 2 Responses to Riff Raff, just say no.. I have my views of the SBSC. And they were not favorable by attending the SMB Nation for the previous 2 years — one reason I too am not attending this year. The arrogance Harry displays runs too thick for me. The entire event just feels like a living infomercial. The only reason I went the second time was to network. As far as the presence of the SBSC in the NGs, its the equivalent of watching Shark Week of the Discovery Channel. I want to find those techs and admins out there who know what the hell they are doing and learn from them — not purchase a $800 ticket, take 4 days off work, only to come back talking about how much a enjoyed the lack of humidity in Redmond. 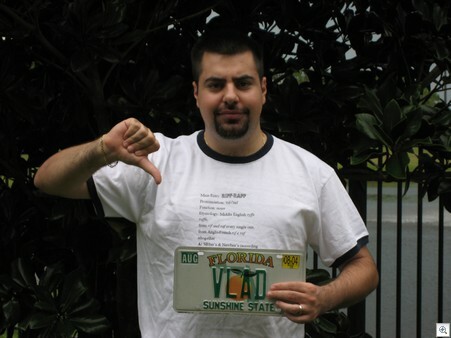 Pingback: David Mackie's Blue Brain : Vlad Mazek - Vladville Blog » Blog Archive » Riff Raff, just say no..